On this date in 1256, Louis II, Duke of Bavaria, had his wife Marie of Brabant beheaded at Donauworth for adultery. 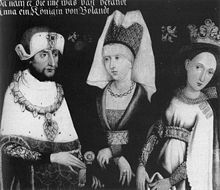 Louis II depicted with the first two of his three wives: Marie, and the more fortunate Anna of Glogau. This 26-year-old uncle of the doomed Conradin was kept away from his spouse for many months on state affairs. At some point, he returned furiously convinced of his wife’s infidelity. [Lewis] held his Court in Heidelberg, and by him stood ever his dearest friend, Henry, Count of Leiningen, and to him one day the anxious wife sent a letter, beseeching he would use his influence to quicken her husband’s return. Another missive was dispatched at the same time to Duke Lewis … The old mistake was made, Duke Lewis received the letter destined for his friend, wherein the artless Duchess had assured Henry of Leiningen that, if he accompanied her lord in his return, her pleasure in welcoming him would be great. That Marie really did exist and really was beheaded on her husband’s authority for adultery appears to be about the extent of the certain information available to us. This poignant scenario became embroidered into popular legend (and is supposed to have inspired the tale of one of the classic medieval faithful-accused-wife tales: that of Genevieve of Brabant). The accusation evidently appeared quite doubtful in real life, since her husband and executioner Louis subsequently founded the Cistercian Furstenfeld Abbey in penitence. She is not to be confused with Marie de Brabant, Queen of France later in the 13th century and a suspect in the poisoning death of the French heir … an affair that cost chamberlain Pierre de la Brosse his life. The words Dante wrote of that later Marie of Brabant would have suited our day’s heroine, too.